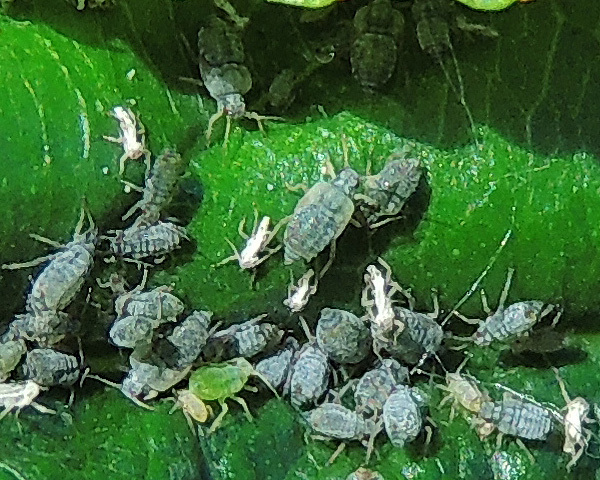 Adult apterae of Aphis commensalis are darkish grey-green with a heavy greyish wax coating (see first picture below). The abdominal dorsum has no pigmented sclerites except for faint narrow bands across tergites 7-8. Small marginal tubercles are present on the first and seventh abdominal tergites. Hairs on the tibiae are long and fine, the longest on the hind tibia being 1.7-2.4 times the least width of the tibia. The dusky siphunculi are rather short being only 0.9-1.2 times as long as the cauda. The cauda is short and blunt. Body length of the adult Aphis commensalis aptera is 0.9-1.7 mm. 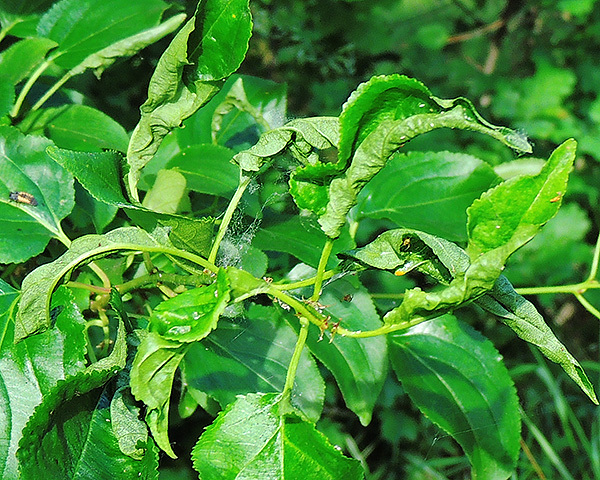 The waxy buckthorn aphid lives on purging buckthorn (Rhamnus cathartica). Early generations cause leaf curl galls on the young foliage of its host as shown in the second picture above. From midsummer onwards they are found in abandoned leaf-edge fold galls of the psyllid Trichochermes walkeri. Apterous males and oviparae occur in October, and eggs are laid within the psyllid gall. Aphis commensalis is a rare species in Britain, known only from Cambridgeshire and Warwickshire. Elsewhere in Europe it is found in Germany, Poland, Austria and Russia. Blackman & Eastop list 15 species of aphid as feeding on common buckthorn (=purging buckthorn, Rhamnus cathartica) worldwide, and provide formal identification keys. Of those aphid species, Baker (2015) lists 11 as occurring in Britain: Aphis commensalis, Aphis craccivora, Aphis fabae, Aphis frangulae group, Aphis gossypii, Aphis mammulata, Aphis nasturtii, Aphis spiraecola, Brachycaudus helichrysi, Myzus persicae and Neomyzus circumflexus.